Georgia Tech's Bobby Dodd Stadium at Grant Field is sort of right next to Interstate 85 South in Midtown Atlanta. At nighttime, the skyline behind the stadium is absolutely beautiful. 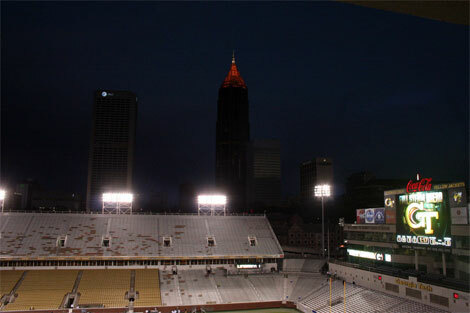 Although this picture from the November 28, 2009 Georgia - Georgia Tech game cannot do it justice, it might give you an idea of what I am saying.